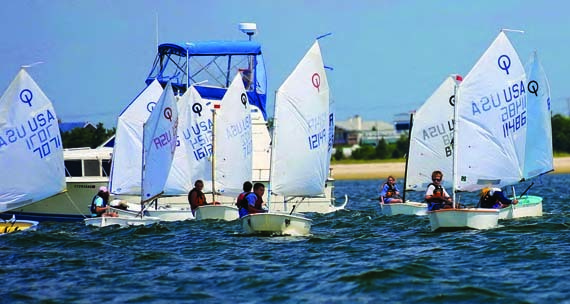 The annual Make-A-Wish Junior Sailors Regatta, hosted by the Northport Yacht Club (NYC), will be held in Long Island’s Northport Bay on Friday, July 19. 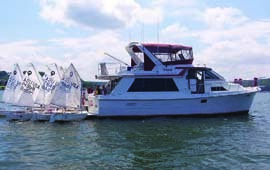 The regatta has been held since 1996 with the purpose of helping children with life-threatening illnesses get a wish granted by the Make-A-Wish Foundation of Suffolk County. In addition to NYC, participating clubs and organizations include Centerport Yacht Club, the Head of the Bay Club, Huntington Yacht Club, Cold Spring Harbor Beach Club and the Huntington YMCA. Like all regattas, the day is always a flurry of activity getting boats rigged while awaiting the harbor start with the sound of the cannon. Even though this is not a Junior Sailing Association of Long Island Sound (JSA)-sanctioned regatta, it is run like one. Because of the size of Northport Bay, the NYC race committee is able to set four different triangular courses: Opti Green – for all first year junior sailors who have not raced in a JSA regatta; Opti White, Blue and Red; Pixels and Blue Jays; and Club 420s and Lasers. Depending on conditions, up to five races are held. An NYC member’s yacht serves as the committee boat on each course, and they have been used as rain shelters, lunchrooms and First Aid stations. Parents are welcome to watch the action from the committee boats. When the sailing is over, the second part of the fun begins with Italian ices handed out by the dock. Next is a pool party with a DJ spinning music of the sailors’ choice. Plaques are awarded to the top four finishers in each division, and a barbeque follows the awards ceremony. The 25 sailors who raise the most funds for the Make-A-Wish Foundation of Suffolk County get to choose from 25 prizes donated by local businesses and NYC members. Although regatta participants are not required to raise funds, many do an outstanding job. Last year, Keara Doherty raised over $7,500 by writing letters to relatives and friends asking for donations to the Make-A-Wish Foundation. This year’s prizes include a custom stand-up paddleboard donated by PdJ Boards Corp. of Northport, a nautical inspired Pandora bracelet donated by The Window Shop Jewelers of Northport, and a kayak donated by Glacier Bay Sports of Northport. For more information, contact Bob Doherty at 631-757-3174 orpbkd223@optonline.net.